Do you send holiday cards to all your friends, family, and colleagues? Choose from a variety of Holy Women Icons cards! 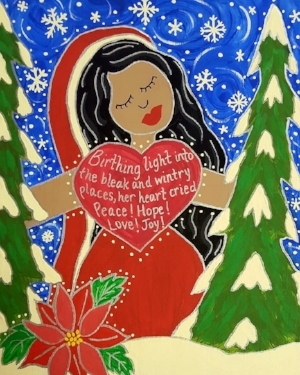 We recommend the peace, hope, love, and joy embodied in our Our Lady of Light! Prints, Totes, Mugs, and More! Want to give someone a Holy Woman Icon, but don’t want to spring for an original? No problem! There are a variety of prints, tote bags, throw pillows, cell phone cases, and even shower curtains available through Fine Art America. Coffee mugs, t-shirts, and more are available through Pixels. Suggestion: tote bag for your favorite teacher, mug for the coffee lover in your life, and a cell phone case for your favorite millennial! Plus, you can use promo code SAGDSG to receive 10% off all purchases through Fine Art America and Pixels! 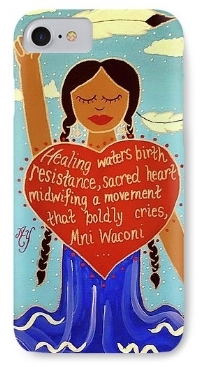 $50 OFF All Original Holy Women Icons! If you do want to give someone an original icon, get $50 off through December 15! Commissions are also $50 off! So, all originals are only $300! Check out which original icons are still available by clicking here. Simply contact us at holywomenicons@gmail.com to purchase an original or commission a new icon! The perfect gift for your favorite feminist reader is one of our books! From contemplative coloring books, practical guides, to theory, click here to learn a bit more about each book. If you need a balm throughout the holiday season, or if you want to offer an online retreat as a gift, check out our online retreat offerings! A 7-Day Online Self-Care Retreat is sure to offer peace and calm, and our Advent Daily Reflections can nourish the spirit every single day during Advent! Donations to Your Favorite Non-Profit! As always, we welcome any donations. You can even make a donation in honor or memory of your favorite holy woman! Bonus: all donations are tax-deductible! Whether it’s a creative holiday card, a metal print of your favorite icon, commissioning a new icon, a coloring book, an online self-care retreat, or making a donation, we offer an array of creative and empowering gifts for everyone on your holiday list! And we’re tremendously thankful for your support! All money raised through these sales helps us empower marginalized women by telling the stories of revolutionary holy women through art, writing, and special events!